Wilson Chamber of Commerce - Part-time Administrative Assistant - Job Description - PublicLayout - Wilson Chamber of Commerce, NC ? The Wilson Chamber of Commerce is looking to add a part-time Administrative Assistant to it’s team! Mail or email inquiries ONLY. Inquiries in person, by phone, or other means will not be considered. The Wilson Chamber of Commerce is seeking a committed individual to serve on a dynamic team as an Office Assistant. This position serves as the first point of contact for many visitors to Wilson and the Chamber: exemplary interpersonal skills, familiarity with Wilson, its businesses and the surrounding community, and professional administrative experience are required. The preferred candidate will have a firm understanding of basic office technologies, demonstrated customer service experience, and able to quickly learn and adapt to changing conditions. High school diploma required; some college preferred, with coursework related to customer service recommended. Certification as a Notary Public (or willingness and ability to become certified) is highly preferred. Primary contact with public at counter and by telephone and email. Become familiar with the operations of all departments within the Chamber so that technical and specific inquiries may be directed to them. Aid full time staff to fulfill essential Chamber functions as directed. Protect the professional image of the Chamber facility by keeping common areas clean and inviting for members and guests. Receive and respond to all telephone, mail, facsimile and email inquiries to the Chamber other than those requested or directed to a specific department. Distribute and forward daily mail. Provide secretarial and other clerical support for the Board of Directors and other programs assigned by the President. Maintain the petty cash box and balance monthly. Keep inventory of publications including maps, collages and Wilson Pictorial History books. Keep the calendar for meetings scheduled for the President and in Chamber conference rooms. Oversee conference room rental and keep application, fee schedule and room setup layouts current. Working in cooperation with other facilities staff, prepare the conference room for monthly committee meetings and prepare monthly schedule for maintenance. Using appropriate software, manage reservations and details of attendance to Chamber socials and events. Maintain inventory of office and hospitality supplies and replenish as necessary. Serve as the professional assistant to the President. This is an hourly wage position, negotiable based on qualifications. This position will work approximately 16 hours a week. Additional working hours may be made available according to the Chamber calendar. 95% of work time is spent in a typical office setting, performing regular office functions. 5% of work time is spent off-site (including at member businesses and event venues), completing tasks that help the Chamber achieve its program of work and engaging with current and prospective members. Occasionally, tasks related to the Chamber’s program of work will be physically demanding, and work outdoors in adverse weather conditions may be required. The ability to lift and move objects up to 50 lbs. is required. 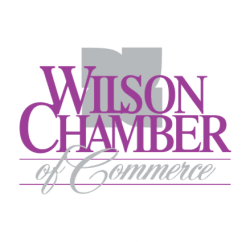 The Wilson Chamber of Commerce is a 501c6 membership organization, and has been Wilson’s premier business network since 1897. Our mission is to support and advance the interests of the greater Wilson business community by providing networking, advocacy, marketing, and education value to our members. Our vision is to be the respected, representative voice of the greater Wilson business community, leading efforts to make Wilson a premier destination for business.